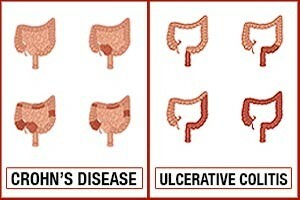 Crohn’s and Colitis Awareness Week runs from December 1 through December 7, so we present articles relating to these inflammatory bowel diseases including the differences and similarities of Crohn’s disease vs. ulcerative colitis, the impact of these chronic conditions on sleep and depression. Although there is currently no cure for neither Crohn’s disease nor colitis, both can be managed with proper medications and treatment. Crohn’s disease and ulcerative colitis – both gastrointestinal diseases – have been tied to anxiety and depression. In a previous study researchers found that not only is Crohn’s disease tied to depression but that depression can increase inflammatory flare-ups related to Crohn’s. Inflammatory bowel disease (IBD) is linked to diversity of viruses and gut bacteria. The findings come from researchers at the Washington University School of Medicine. The researchers found that patients with inflammatory bowel disease had a greater variety of viruses in their digestive system compared to healthy volunteers, suggesting that viruses may play a role in inflammatory bowel diseases.